Newcastle Drainer Spade. Made from hardened and tempered steel and metal with a high-tensile steel shaft and extendable lugs adjust to a safety boot's width. 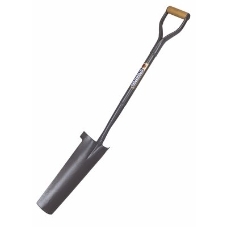 Use for digging deep narrow holes.